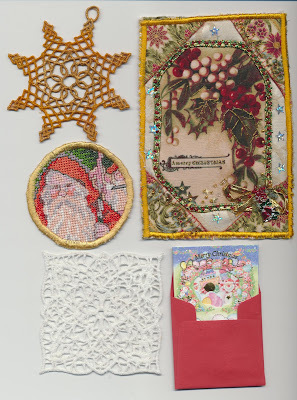 The Southern Cross Crazies hosted a Christmas Present swap plus a Christmas postcard swap this year. I have been so very, very lucky with the beautiful gifts that I have received from Maxine, Alison and Florence, not to mention the gorgeous postcards from so many friends around Australia. 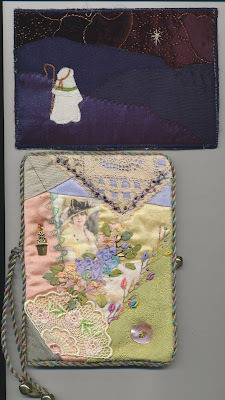 This is the needlecase which Alison made for me with the "Silent Night" postcard she sent as well. I love the fact that the needlecase is a very generous size, 7inches x 5 inches. 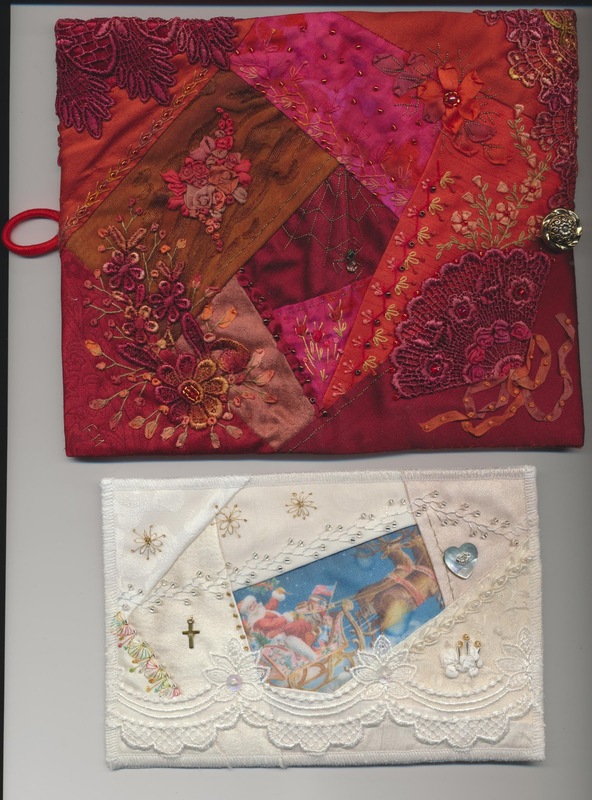 Florence made me this very special note-book with the heavily embellished back and front covers. I am going to use it to keep a record of crazy quilting stitches. Below it is the Christmas postcard she made with Santa and his reindeers on a sparkly, snowy background. This is the heart decorations that Maxine made for me. 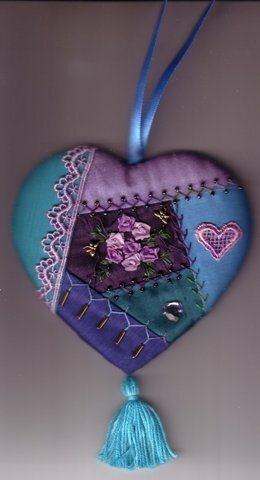 I really love the purple and turquoise colour theme and those tiny Roses in the centre are to die for. Each one is exactly the same size and shape as all the others. I love it. 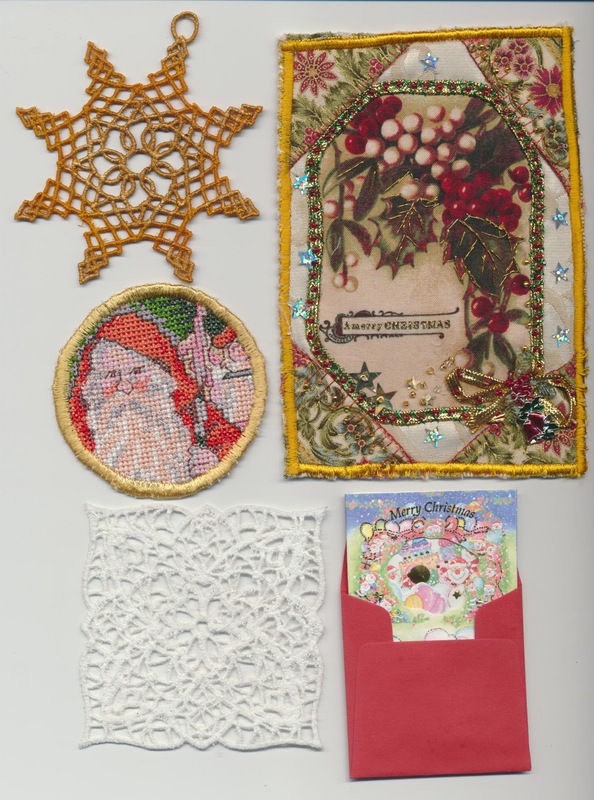 This group of "German Christmas" postcard and machine made lacy decorations as well as the tiny animated card and the circular Father Christmas decoration came from Natascha. Natascha and her machine are a fantastic team!! You're so lucky to be the receiver of such beautiful gifts. The talent is amazing! !